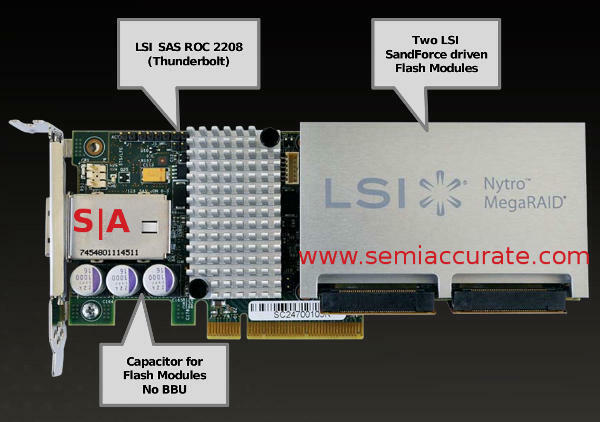 LSI and Intel have just announced a new caching SAS RAID controller called the Nytro MegaRAID with a twist, two SSDs. If you want speed from rotating media, 1TB of flash as a cache should do the trick. The board is going to be sold by both LSI and many partners, the first one to shout from the rooftops is Intel. Intel likely wanted to be first to stamp their brand on this market with their 256GB RCS25ZB040 and 1TB RCS25ZB040LX (Powered by LSI Nytro MegaRAID technology). This is quite simply breathtaking enterprise marketing unseen since the magical 28F016XD (Note: See stat sheet E28F016XD-85 to relive the glory days). Given the target audience neither one will be cheap, but you get what you pay for in this space. Entry price for one of these boards is an LSI version with 100GB of SLC flash that costs $1795 MSRP. Things go up from there. Cheap MLC flash costs less than $1/GB, high bin stuff is notably more with SLC a premium on that. 1TB of cache in the Intel boards will add significantly to the price, but in this market segment performance and reliability is worth paying for. Ironically there is nothing new on this board, it is all old chips and the concept is the same as the old Adaptec/Intel MaxIQ products. That said, when was the last time you saw a board with two 512GB SSDs as just a cache? The idea is simple, the RAID controller has some firmware that allows it to use two massive SSDs as a large cache, slow by RAM standards, fast by magnetic drive standards. The slowness is a relative thing vs DRAM or SRAM, the RoC mainly intelligently shunts hot data to the SSDs where it is written and read back instead of having to access the slower rotating media. In theory you get the best of both worlds, the near instant response of an SSD and the capacity of magnetic storage. Since this is the second generation SSD caching RAID card that Intel is involved with, you can probably surmise that there is real benefit to be had from the concept. One nice touch is the added caps that are included on the card, presumably enough to write any non-flushed caches to the SSD in the event of a data center ‘whoopsie’. That is technical terminology for someone high up enough in the food chain asking, “What happens if I pull on this cable marked 110V?”, followed by the sounds of fans spinning down. In a departure from the normal SSD way of doing things, the caps are on the RAID card instead of on the drives themselves. This doesn’t preclude having more caps on the SDD PCB, but it kind of makes them a moot point. The brains of it all is a current LSI 2208 PCIe3 SAS-6 RoC that uses either 256GB or 1TB of SSDs, two SATA6 drives so it is dual channel mind you, as a cache. The 2208 can support up to 8 SAS or SATA ports directly, 64 LUNs if you so choose. With the cache the Nytro MegaRAID supports it actually makes sense to trade off a little bandwidth to support multiple drives per channel. The caps make sure all the data is secure during whoopsies, something that should be exceedingly rare in a real data center even if your enterprise is management personnel heavy. Who is this card aimed at? If you didn’t say gamers, congratulations you have hit at least close to the target. This card isn’t really good at high speed sequential data loading, conventional RAID does that just as well, as do SSDs. Most of the things you immediately think the Nytro MegaRAID would be good for might be better served by pulling the SSDs from the cards and just using them. The Nytro MegaRAID is aimed at enterprises, specifically VDI, Hadoop/NoSQL, and other high user count random access workloads, not the end users themselves. It also speeds up array rebuilds tremendously because it can allow the drives to dedicate much more of their time to the task instead of random reads and writes. None of this should be a shock to you, Hadoop needs random data from a large set, but with a 1TB cache you have a very good chance of hitting what you need there. The reads are not perfectly random either so magnetic storage tends to only be used for the oddball stuff. Speeding up the common while freeing up slower resources for the uncommon is not a complex idea to understand. Similarly VDI tends to use a significant portion of the data requested, basically the common files in a boot image over and over and over. How much difference do you think there is between Windows installs in a large corporate deployment? If you are thinking basically the malware and desktop backgrounds you are right. Lets call that about 27% of the files, .38% being the backgrounds.